Lovestruck Randy gets more than he bargained for when he finally gets to meet his prison pen pal Crystal. Inspired by UK television documentary Jail Date, a film which explored why increasing numbers of men are choosing to date women behind bars over the girl next door. 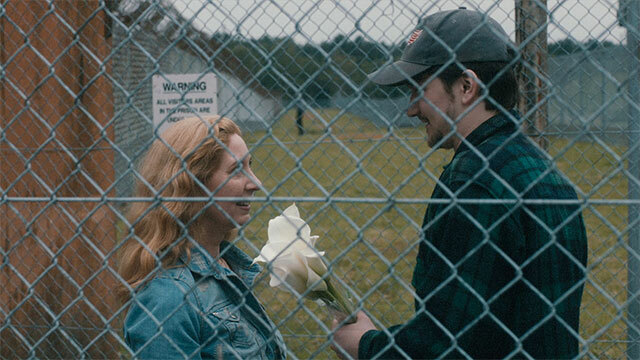 Ben Aston’s engaging short Dinner and a Movie is the comedic tale of unsuspecting singleton Randy, as his search for love leads him into the arms of his recently released prison pen pal. Scared of love, our infatuated protagonist’s belief that he has found a risk-free way of finding a relationship are soon tested when his prospective partner brings some unexpected baggage to their first date. Eager to build on the blossoming creative partnership on show in Dinner and a Movie, director Aston and writer Hummer are now working on their second movie together He Took His Skin Off For Me. Described by the filmmaker as “a sort of domestic fairytale about a man who takes his skin off for his girlfriend, and why it probably wasn’t the best idea”. HTHSOFM is currently in the final stages of post-production, with Aston planning to take it on a tour of film festivals before releasing it online for us all to bask its fleshy uniqueness.